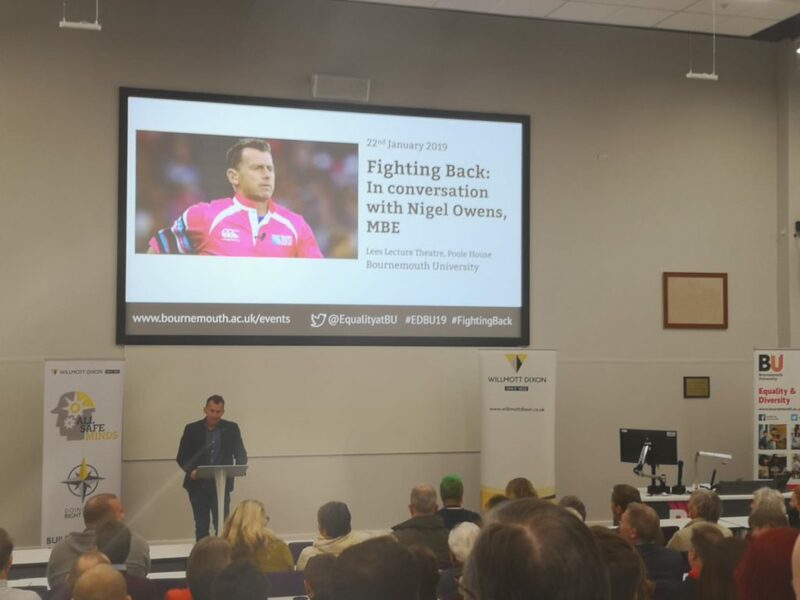 Last night I had the pleasure of representing Dorset Mind at Fighting Back: In Conversation with Nigel Owens, MBE. 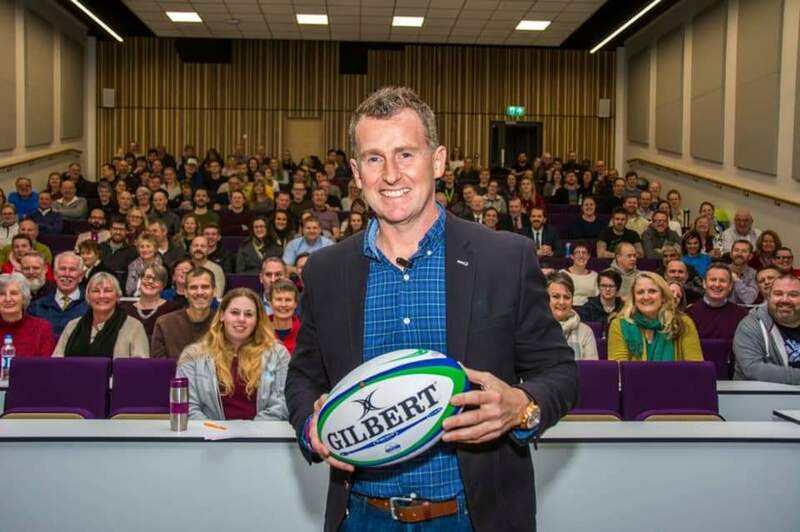 Nigel Owens is a very successful rugby referee from Wales, who has experienced a lot of adversity due to his sexual orientation. I was fortunate enough to hear him share his experiences with his mental health, eating disorders and bullying. Despite having loving parents, his early life was tainted by hate. Nigel experienced bullying as a young person. This bullying caused him to dread going to school, so he would often miss it, falling into a bad crowd. “Going to school in the morning with a horrible feeling in your stomach- that’s what it feels like to be bullied as a young person”. “Not only do we have responsibility in what we say and do, we have even more of a responsibility when we stand by and say nothing”. Nigel went on to describe his journey with his sexuality. “At 19, I found myself on some occasions finding myself attracted to men… This was completely alien to me, growing up in a small village… It was not something I wanted to happen”. He struggled to come to terms with who he was, unable to accept himself or imagine the world accepting him. “I was becoming something I didn’t want to be- I was scared. Living in the fear of what people would say”. Nigel’s self-esteem and fear sent his mental health spiralling; he felt trapped in a life he didn’t want. “I went into a darker place, deeply depressed… I thought there was only one way out”. Nigel attempted to take his own life when he was 26. However, Nigel’s story did not end that day. His early difficulties did not define his future. It wasn’t easy, but Nigel began to accept and love himself. The first step to self-acceptance was admitting to himself who he was and how he felt. “Whatever is worrying you and getting you down, until you accept these issues exist, you can’t begin to deal with them. Accepting himself transformed his life. “If you are carrying around a worry, if you manage to let go of it, it is the most wonderful feeling in the world”. His many accomplishments truly reflect how inspirational he is. His story shows us how important it is not to give up, even in the hardest of times. It possible to come out of a dark place, happier, wiser and more prepared for the next challenge. Nigel Owens values respect for fellow human beings above anything else. We should all strive to become kinder to ourselves, and each other, every day. Keep being you. 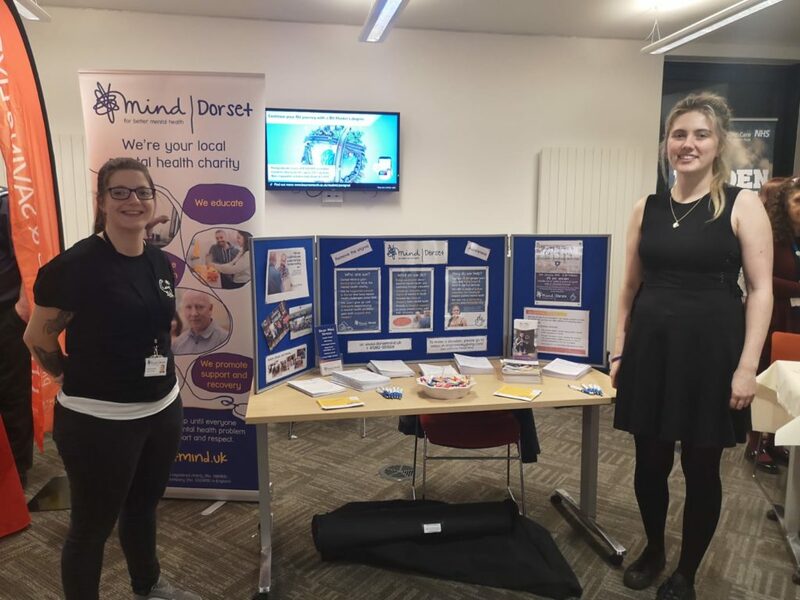 Article written by Lucy Lewis, Social Media and Marketing Assistant.